Released in the US in November, at the same time with the Lumia 950, the Microsoft Lumia 950 XL is the most powerful Windows 10 handset on the market. Unlike the 950, the 950 XL is not offered via any US carrier, so you can only buy it unlocked. If you think the smartphone's normal price ($629.99) is too high, we're happy to inform you that, at the moment, B&H is selling the Lumia 950 XL for $100 less, asking only $529.95 for an unlocked unit (in either black, or white). The retailer notes that there's "limited supply at this price", so you may want to hurry up if you intend to take advantage of the deal. With its 5.7 Quad HD (1440 x 2560 pixels) display, the Microsoft Lumia 950 XL is one of the largest Windows-based smartphones ever. Besides the screen, the handset's highlight features include Microsoft Continuum, a 20 MP PureView rear camera, an octa-core Snapdragon 810 processor, 3 GB of RAM, and a 3340 mAh battery with wireless charging. 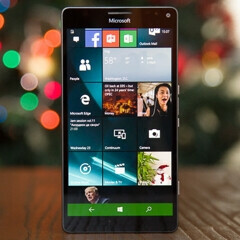 To find out more about the handset, read our Microsoft Lumia 950 XL review. Unfortunately, the total lack of apps and horribly buggy OS makes this phone a loser... Way too many alternatives out there to even consider this. There's bugs on all the operating systems. Didn't we just read the other day about Apple releasing an update to fix over 100 bugs on their latest OS. I would love to go back to Wp, but due to no apps. No thanks. Merge with Android, just like BB, then yes definitely would buy that 950XL. You are so right, 669000 apps (as of September of last year) is such a minute number that I won't go back to WP either!!! Show me (legit from the actual company) Snapchat and Instagram for windows. That is all they care about, and if its missing those 2 apps, people dont care if the company has 3 trillion apps, it just has to have the apps that they want. Not everyone cares about Snapchat or Instagram and if all those people only care about the 2 apps mentioned and not at least a few of the other 3 trillion apps, I say they should get a life then. Well then how about Chase mobile which hasn't been supported since the middle of last year? Lol windows is a beautiful OS that suffers from bugs like any OS. Such as Hyper Sleep from a doze feature. Go get your Bloatsung and leave a true OS to the adults. I just recently broke my Sony z3 and for now using my back up phone Nokia 521..and everytime when I click on WP market from looking at apps on there I wish to laugh and cry at the same time :D Windows acting like they don't care about improving quality app selection. They care, there just isn't a whole lot they can do about it. They can't make developers release software for their OS. The problems for the 950/XL are exacerbated by their app marketplace, but most 2015 smartphone flagships will be on fire sales soon due to the garbage SD808/810 most were stuck with last year. As soon as the SD820 flagships start arriving, I predict a bigger decline in ASP than normal for that very reason. High end phone with a very poor store. So a big NO! This phone has had several price drops and hasn't sold well at all. Every review says it is buggy with no update coming anytime soon. Windows doesn't sell bc it has terrible apps or apps that don't work well. This phone was supposed to rival iPhone and we see how that worked out. And no I don't have an iPhone!